The established method for the production of synthetic peptides in the lab is known as solid-phase peptide synthesis (SPPS). 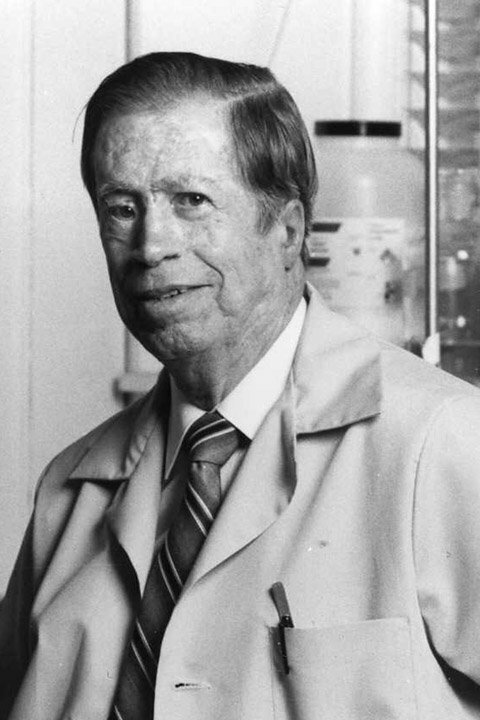 Pioneered by Robert Bruce Merrifield, organic chemist and Nobel laureate for his invention of solid phase peptide synthesis. SPPS allows the rapid assembly of a peptide chain through successive reactions of amino acid derivatives on an insoluble porous support. The solid support consists of small, polymeric resin beads functionalized with reactive groups (such as amine or hydroxyl groups) that link to the nascent peptide chain. Since the peptide remains covalently attached to the support throughout the synthesis, excess reagents and side products can be removed by washing and filtration. This approach circumvents the comparatively time-consuming isolation of the product peptide from solution after each reaction step, which would be required when using conventional solution-phase synthesis. Our Custom Peptide Services use solid and solution phase chemistry employing Fmoc and t-Boc methodologies. Large, unusual and specially designed peptide is available. In addition, we offer a full range of labeling and modification options. Chemoselective ligation methods are important tools for obtaining various peptide conjugates or scaffolds. 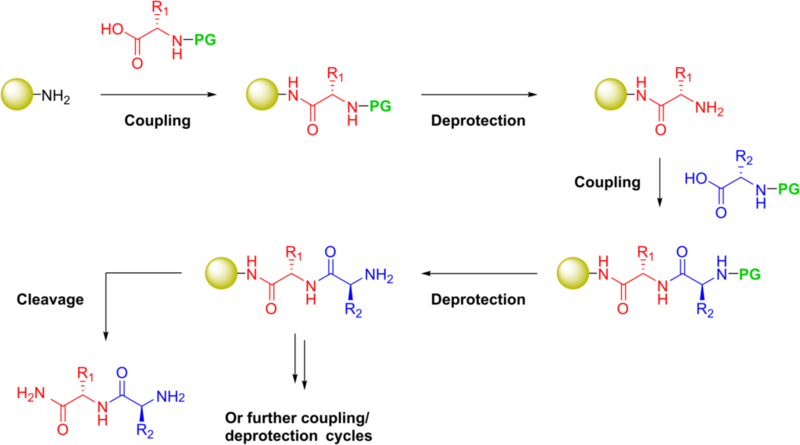 In particular, thiol-based ligation methods that enable the formation of a thioether, disulfide, or thiazolidine bond between unprotected peptides or biomolecules are very popular because of their efficiency, the ease of introducing a thiol group in peptides using cysteine residue, and, lastly, the possibility of combining some of these techniques with other chemoselective ligation methods. Thiocarbamate ligation belongs to the family of thiol-based chemoselective ligation methods and is the subject of this section. Interestingly, the thiocarbamate bond is considered to be a peptide bond bioisostere. 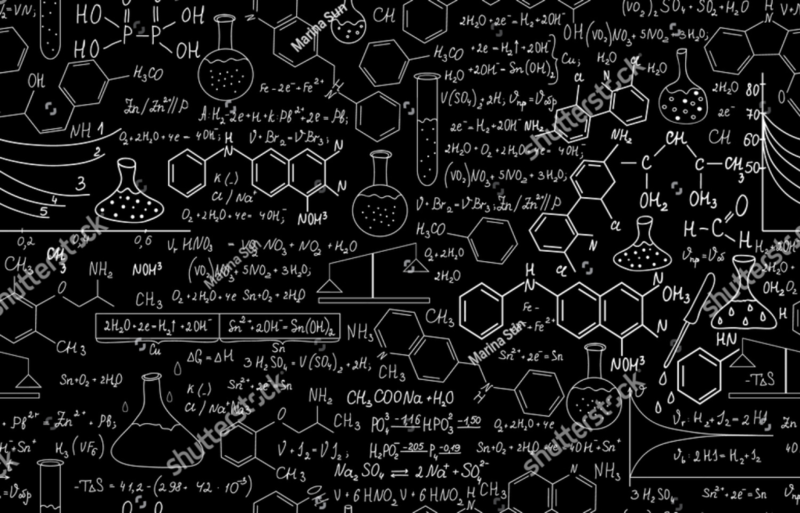 This, combined with the specific features of the S-CO-NH group chemistry or biochemistry, makes thiocarbamate ligation of potential interest for building molecules and modulating their physicochemical or biological properties. One significant limitation of the method is the sensitivity of the thioester bond toward hydrolysis at neutral pH or in the presence of nucleophiles. For example, Kent and co-workers noticed that a thioester bond of the type -NHCH2COSCH2CO- displayed a half-life of 2 h at pH 7.5. However, the thioester analogue of HIV-1 protease reported in their seminal paper was stable in the pH range 4 to 6. Similar results were reported by Tam and co-workers using model thioester peptide Gly-SCH2-CO-Ala-Lys-Ala. Thus, thioester ligation is best carried out at mildly acidic pH (pH-4.3) to avoid the hydrolysis of the target product during the ligation reaction. At this pH, the thioacid is mainly in the thiocarboxylate form because of the low pKa of thioacids and is a better nucleophile than the thiol group of cysteine so that the thiocarboxylate group can be selectively alkylated at pH 4 in the presence of cysteine residues. In contrast, an alkylthiocarbamate bond is stable in a wide pH range (2-7.5). The ligation can be performed in pH 7.4 phosphate buffer or in an organic solvent such as N,N-dimethylformamide (DMF) in the presence of triethylamine, whereas HPLC monitoring and purification can be done as usual using acidic water–acetonitrile gradients. Another significant limitation of thioester ligation is the limited access to the thioacid component because of the sensitivity of the thioacid functionality to various nucleophiles, oxidants, and electrophilic reagents. In particular, the Fmoc-SPPS of peptide thioacids is highly challenging, although significant advances have been realized during the past few years. The principle of the thiocarbamate ligation is presented in Scheme 10. The process is based on the reaction of a thiol such as a peptide featuring a cysteine residue with a phenylthiocarbamate component. Basically, it is a thiol–thioester exchange that proceeds efficiently in water at neutral pH. 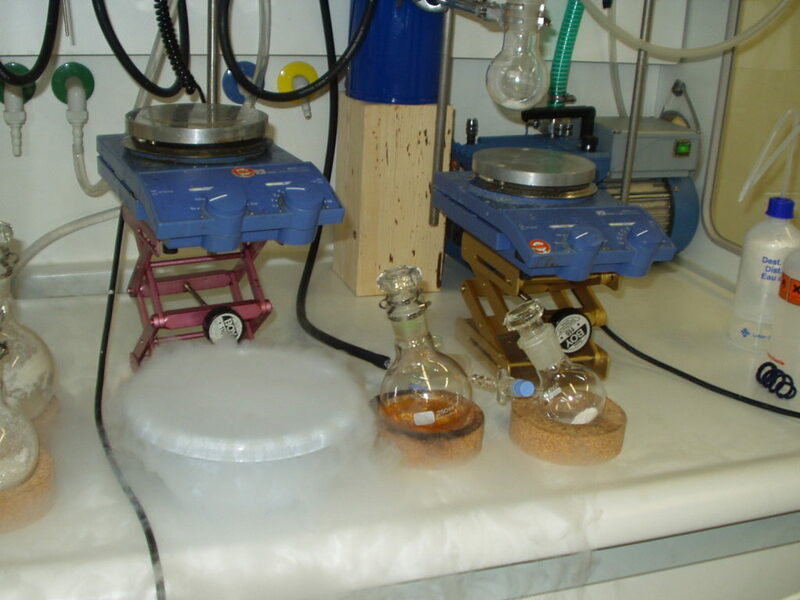 The reaction has been performed in the presence of an excess of thiophenol to minimize the oxidation of the cysteine residue by molecular oxygen. However, recent studies have shown that this is not mandatory because of the high kinetic rates for the ligation in most cases.Given the ease of introducing the N-phenylthiocarbonyl functionality on peptides and the thiol group on various biomolecules or modifiers, thiocarbamate ligation constitutes an interesting chemoselective reaction for obtaining well-defined conjugates. N-phenylthiocarbonyl group is an active thiol ester that can participate in a variety of useful chemical transformations, enabling the synthesis of dendrimers, cyclic peptides, or peptide conjugates. The thiocarbamate ligation product does not rearrange by S,N-acyl shift as observed for thioesters during the NCL reaction, even under forcing conditions. The importance of peptide cyclization for studying peptide conformation, for creating new structures, or for developing peptide therapeutics is well-established. Cyclization enables one to rigidify the structure and to improve the interaction with the molecular target, the biological activity, or the stability. The synthesis of cyclic peptides can be challenging, and various methods have been designed to affect peptide macrocyclization. For a given peptide sequence, it is also of interest to vary the bond formed in the cyclization reaction because its chemical and conformational properties are expected to affect the properties of the target cyclic scaffold. One important method for producing cyclic peptides is the NCL reaction between a β-amino thiol group such as a cysteinyl residue and a thioester group or thioester surrogate. There are two main methods for large-scale production of monoclonal antibodies. These are ascites preparation and roller bottle culture. Ascites preparation：Hybridoma cell lines are cultured in vitro to an indicated concentration and then injected into the mouse abdomen to collect ascites, from which monoclonal antibodies can be purified. Each mouse generates 3~8mL ascites and the concentration of purified antibody reaches 1-10 mg/mL. It takes 3-4 weeks to generate ascites. With advantages of being a fast, low cost, high production method, ascites preparation is still the principal method for large-scale antibody production. Roller bottle culture：Hybridoma cell lines are cultured in vitro in large scale and antibodies can be purified from the culture medium and the content reaches 20~80 mg/L. Roller bottle culture method is advantageous due to the ability to generate high quality antibodies without protein impurities or animal virus. 1. Cell viability of hybridoma should be above 80% of the cell line. 2. Brand of medium for hybridoma cell culture, as well as the catalogue number and preparation protocol . 2. Ascites can be rapidly and efficiently obtained for hybridoma cultivation. 1. Purified monoclonal antibody, of which the purity is above 90%. 2. Test report containing SDS-PAGE result and QC figure of the final concentration. Confidentiality commitment: We guarantee the confidentiality of the information regarding the cell lines provided by clients as well as the information about antibody etc.